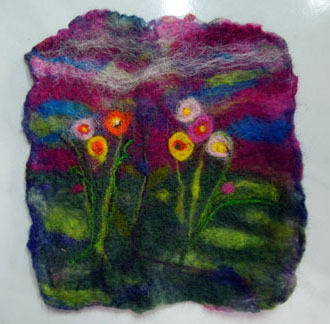 Last Saturday I had the pleasure of leading a three hour felting class with five Crafty Chick friends. 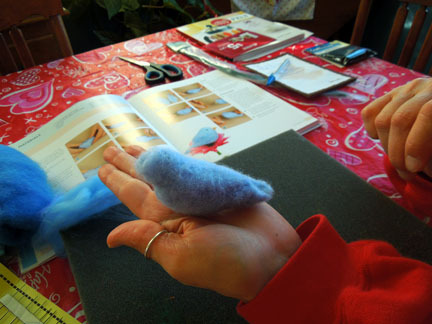 After a potluck lunch we got started with creating a wet felted piece then moved on to needlefelting. Most had not made felt before but all of the Chicks dove in and were great sports about it all. 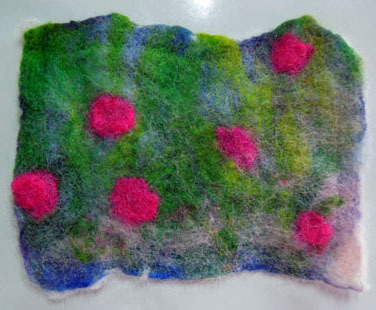 They were even game to try out my Needlefelting machine. I had a great time and I think they did too! 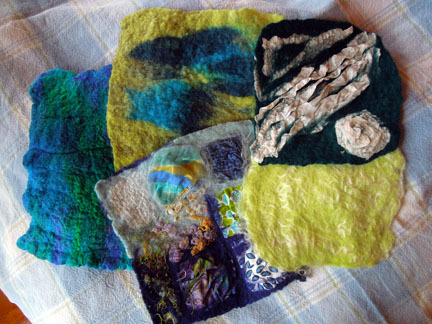 I shared my felting books and showed them my favorites written by Moy McKay, Scottish artist and felter extraordinaire. 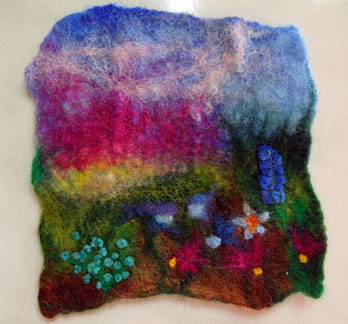 Second step is needle felting in more details. 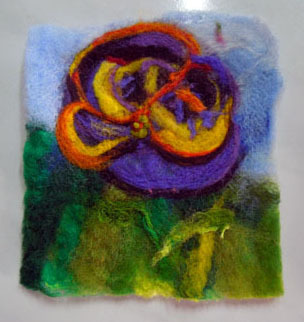 Sue’s felt sample created prior to class and used for a demo. 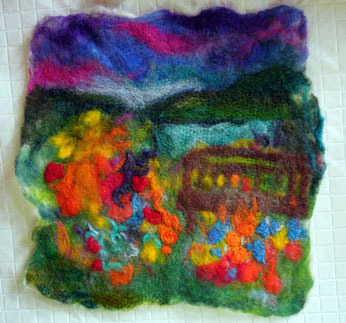 Kearsten’s felted piece ready for hand stitches. With the addition of a little stabilizer material, the pieces are all ready for additional machine and hand stitching to add more details and embellishing. I think they look great for first timers and a short 3 hour lesson. I loved how game everyone was to try a variety of things. 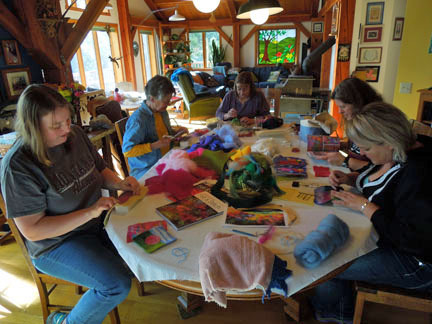 Someone told me recently that they thought I was like a little bird with my art and craft activities, suggesting that I “flitted” from one to another. I couldn’t figure out if it was a compliment or not. At 5′ 10″ tall, it’s hard to picture myself flitting about. 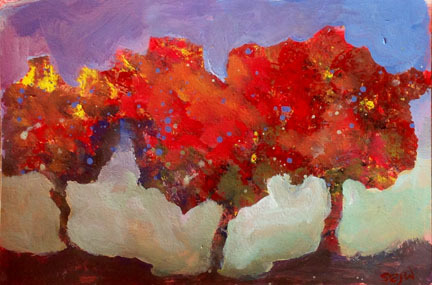 I do know that I sometimes have trouble getting started on a particular project when I have many on my mind, in the works, have new-to-me things to try, or want to revisit a favorite medium and technique. Sometimes though, I just like moving various projects along a few at a time. 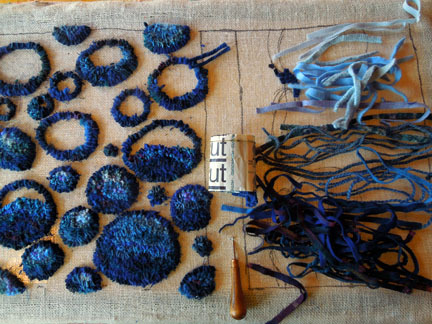 and continued work on a hooked rug pillow that I’ve designed around a theme of water. 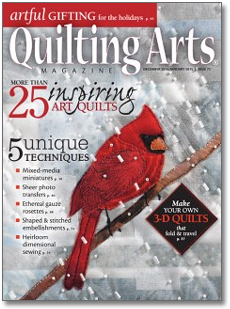 This list doesn’t include the time I’ve spent reading and studying artists and art books. And now it will include getting two blogs posts out before March 1. 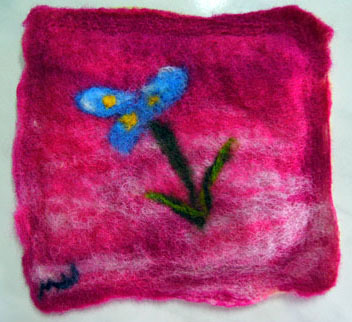 I still don’t know if it’s flitting, lack of focus, or just a crazy, strong desire to create. 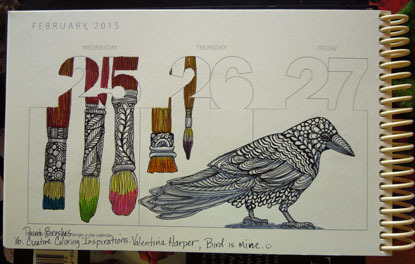 I do know that I love the learning and accomplishing of my creative days. Whatever you want to call it, I appreciate that I have the capacity and time for it. 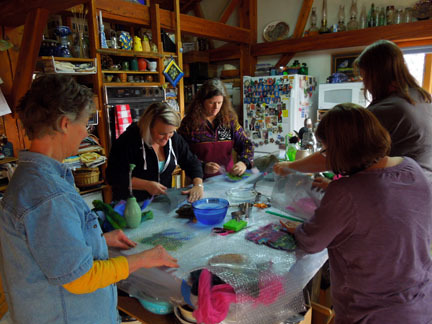 Do you create with single minded focus or do you like to have several projects in the works at a time?